Poland is known for its hearty cuisine. So we followed the traces of the sweeter dishes of Krakow and found a few “sins” we would like to recommend. Waffle Ball serves Waffles with a little twist. Small, connected waffle balls hold the filling. You pick your waffle first: Plain, chocolate or vanilla. Next, you choose your filling. From chocolate to blueberry, there are ten fillings to choose from. 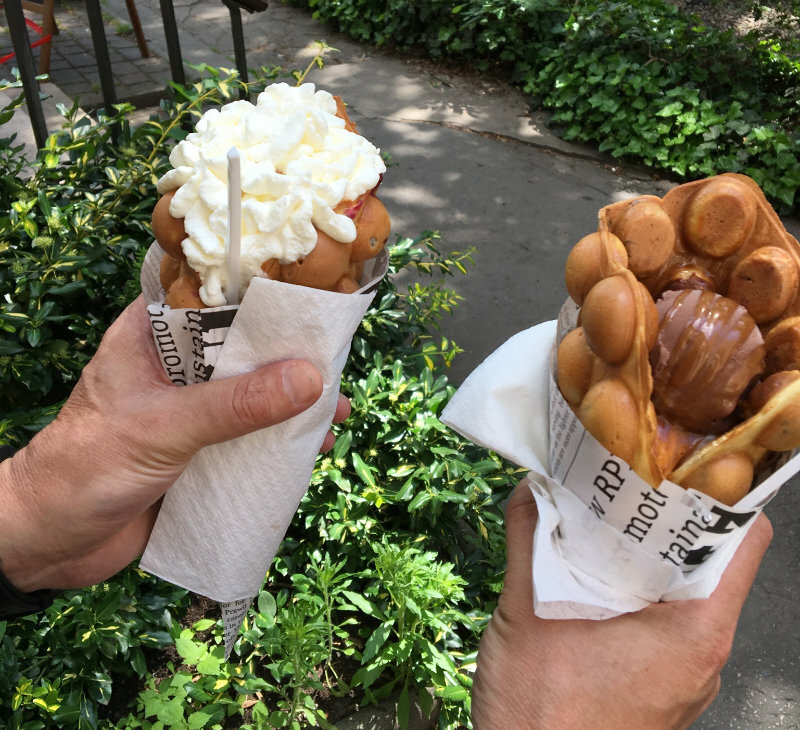 While the waffle is made – they had three waffle irons and each of them was filled by hand to give each individual ball it’s own filling – you get to choose yet another filling. That last filling gets poured into the centre of your waffle balls which get rolled into an ice cream cone. Options range from whipped cream to ice cream to fruit salad. The price depends on how many different components you pick but each of them separately are not very expensive. For those, who like it hearty the waffles can be filled with salad, chicken or ham. The balls come with salami. We picked the sweet option and it was really tasty. Not easy to manage when the ice cream starts dripping through the small hole at the bottom of the cone. You have to know what you’re doing. We both skipped the additional fruit. The portion size was more than enough for us and carried us over until dinner time. Super tasty cakes can be had in the Ciastkarnia Vanilla. The shop has some outside tables for those who want to enjoy the cake right on the spot. The cheesecake was delicious. A very dense cake. A small slice is very filling. Even better was the poppy seed cake. Traditionally, this one is apparently eaten over the Christmas period – I could easily have it the whole year around. 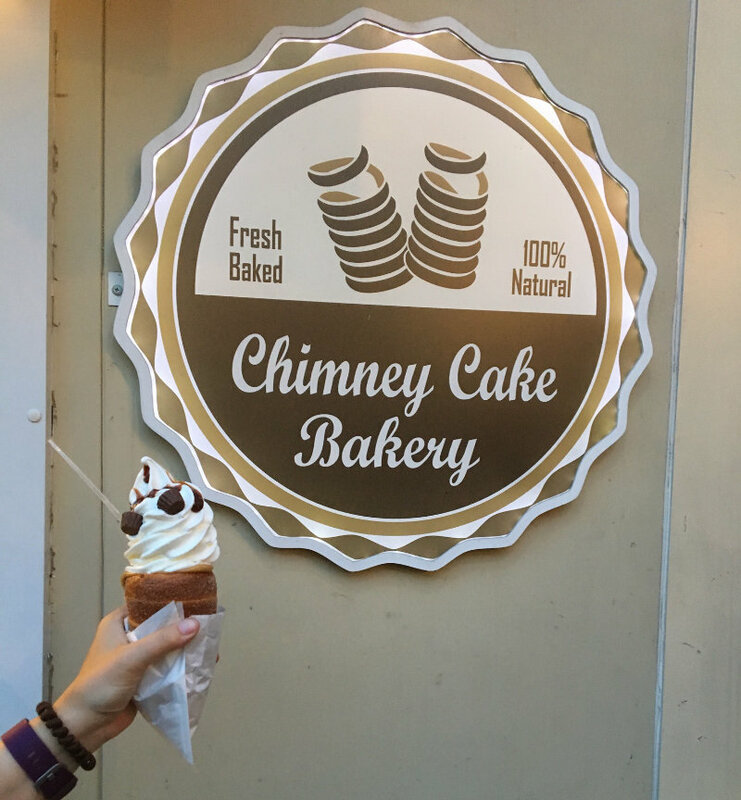 In the midst of a conglomeration of street food trucks, we found the Chimney Cake Bakery truck. The trucks occupy a permanent spot in the Jewish district of Krakow. Apparently, there is also a shop somewhere in the Old Town. Actually, the truck attracted my attention with something that I knew from our trip to Prague. Chimney cakes, which I know under the name Trdelnik, were sold here. Different fillings are available and I was certain I’d have one of those. Until I saw their menu. Something else was on offer: Summer Chimney Cones with caramel, peanut butter or Nutella. My Polish skills are virtually non-existent but it sounded intriguing. And so I ordered it. The cone is made of something that is like a Trdelnik. The inside is filled with caramel, peanut butter or Nutella, depending on what is ordered. 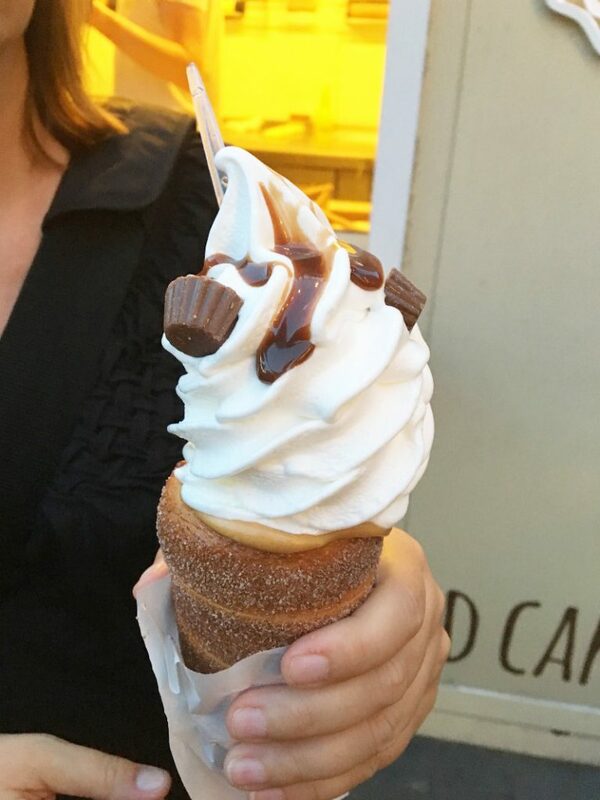 The cone is then filled with ice cream and toppings. I went for peanut butter and enjoyed it a lot. Truly a sweet temptation, these treats of Krakow. Different types of Pierogi are served in the Pierogarnia. Pierogi are filled dumplings that are eaten as starts, mains or desserts. 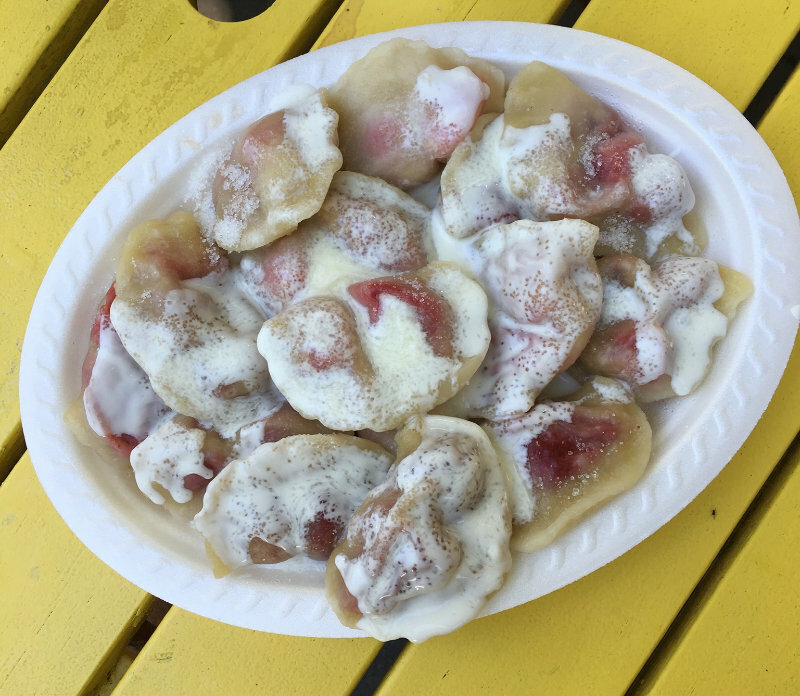 I was introduced to the really tasty treat that is the strawberry Pierogi. The dumpling is filled with a strawberry and is served with icing sugar and custard.